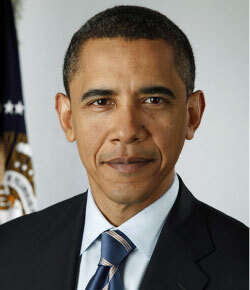 On August 29, 2013, the Obama administration announced two Executive Orders that will restrict the importation and domestic transfers of certain classes of firearms. These two Executive Orders operate as law by fiat, not subject to Congressional concurrence. Professor Lott challenges the need for changes to the NFA Laws as they pertain to corporations: “Again, the Obama administration doesn’t provide examples of people using a corporation to register handguns or semi-automatic rifles as a way to bypass criminal background checks. More importantly, it fails to point to any cases where such guns have been used in crimes. Yes, when registered to a corporation, any officer is allowed to possess the machine gun, but [the transfer] still requires a NICS check for the person actually picking up the gun.” READ Lott Commentary. It’s important to realize that the anti-gun people aren’t interested in gun control as a practical measure to combat “gun violence” or achieve “gun safety”. They are animated above all by a reflexive dislike of guns, and an abhorrence of the very notion of an armed citizenry. Their motives are ideological, rather than practical. To them, it doesn’t matter whether a type of firearm is used in crimes or not; the only good gun is a banned gun. 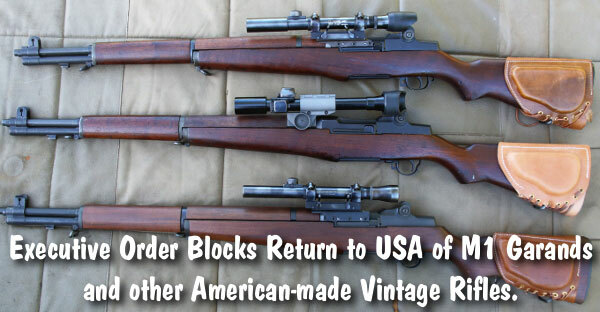 This explains why the efforts in the 70s and 80s to restrict handguns, which still account for the vast majority of gun crimes, were abandoned in favor of an assault on “assault weapons”, .50-caliber rifles, and now, vintage “military-style” rifles and already heavily-restricted NFA weapons — firearms that, though used infrequently or not at all in crimes, are easy to describe in scary terms to the general public. 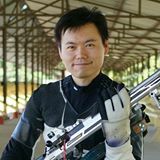 Tony Chow is a target shooter who competes in smallbore and 300-meter disciplines. 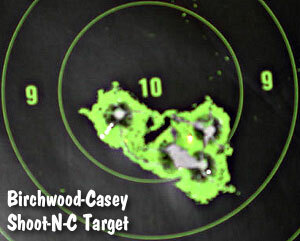 Share the post "President Obama Issues Executive Orders Targeting Firearms"
Birchwood-Casey brand Shoot-N-C targets are great for fun shooting. When your bullet passes through the target, a large yellow splash of color surrounds the bullet hole. This is ideal for plinking at short range without optics. Even when using a powerful scope, the color splash on the high-contrast background helps you see your hits at long range. We’ve been able to see Shoot-N-See bullet hits at 800 yards with a 42-power scope. The only problem with official Shoot-N-See targets is the price. A 30-sheet pack of 8″ Bullseye Shoot-N-C targets costs about $22.00 plus shipping. Making the targets is easy. Simply place the plastic tape over the neon paper. Then spray with matte black paint. Of course do your painting outdoors, in a well-ventilated area! When the paint is dry, cut target to desired size. Watch the video and see how simple it is. Share the post "Make Your Own Shoot-N-C Type Targets for Pennies"
In April 2012, a major controversy arose when Bank of America (BofA) told McMillan Group International (McMillan Group) to take its banking business elsewhere. 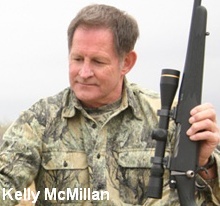 McMillan Group’s President Kelly McMillan was convinced that BofA’s reason for terminating its long-standing relationship with McMillan Group was that the family-run, Phoenix-based company produced firearms. Well Kelly McMillan has fought back against the black-balling of firearms businesses by biased bankers. Kelly has created a new company, McMillan Merchant Solutions, to provide credit card processing for the firearms industry. The new company plans to donate a portion of every credit card transaction to firearms and outdoor associations. McMillan Merchant Solutions is powered by LTD Merchant Services, a registered ISO/MSP of Wells Fargo Bank, N.A. Walnut Creek, CA and a registered ISO/MSP of BMO Harris Bank, Chicago, IL. McMillan Merchant Services handles all major credit card transactions with VISA, MasterCard, Discover, and American Express. For more information on McMillan Merchant Solutions, visit mmsllc.com. 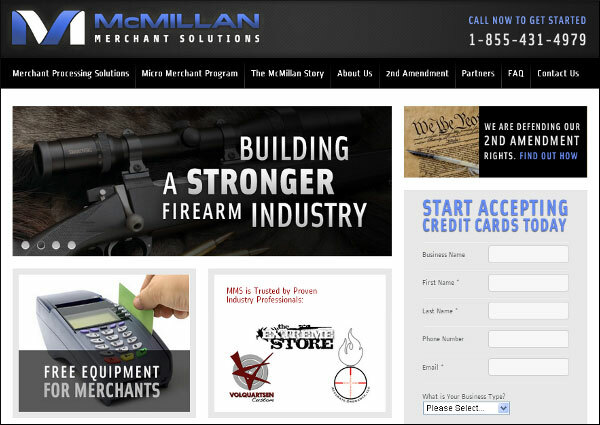 Share the post "McMillan Merchant Solutions Processes Cards for Gun Industry"